Bringing the party to you! 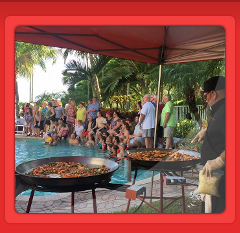 Why Senor Pepe's Paella Catering? 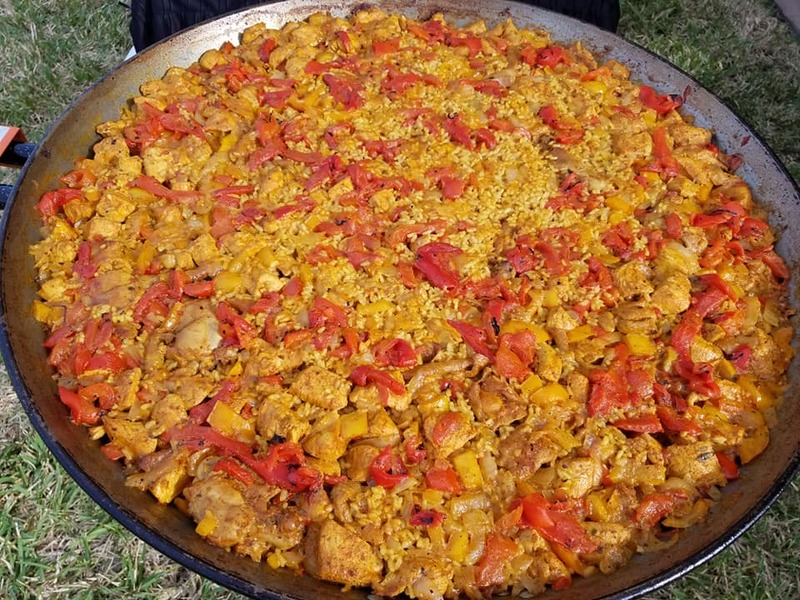 AUTHENTIC PAELLA VALENCIANA - is the original paella and is made from chicken, rabbit and snails. (optional of course), there is no prawn in sight. 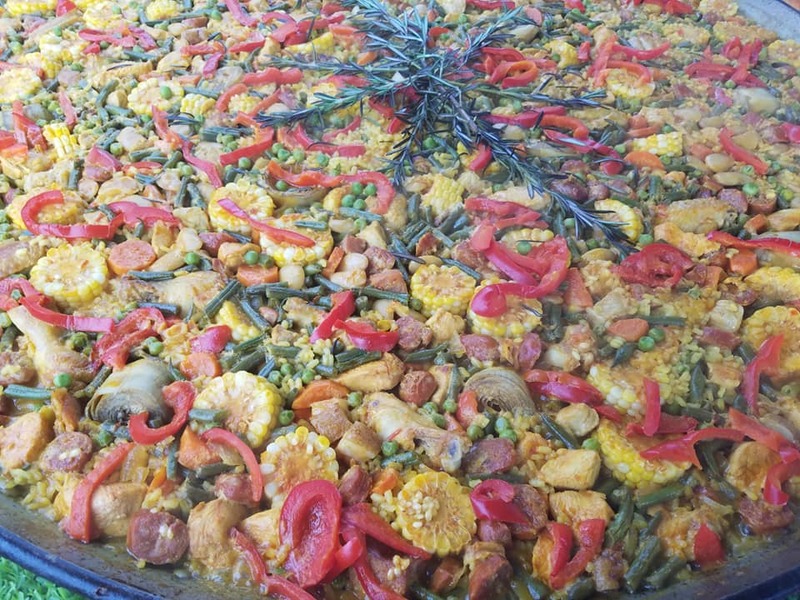 PAELLA VALENCIANA (our recipe)- made with chicken, spanish chorizo, pork (optional) saffron infused rice, green beans, butter beans, tomato sofrito garnished with rosemary, peas and roasted red peppers. PAELLA MARISCO - seafood paella. The fact that valenciana came first is not to say the seafood version is not 'authentic'. Will contain prawns, mussels, fish and calamares (squid). 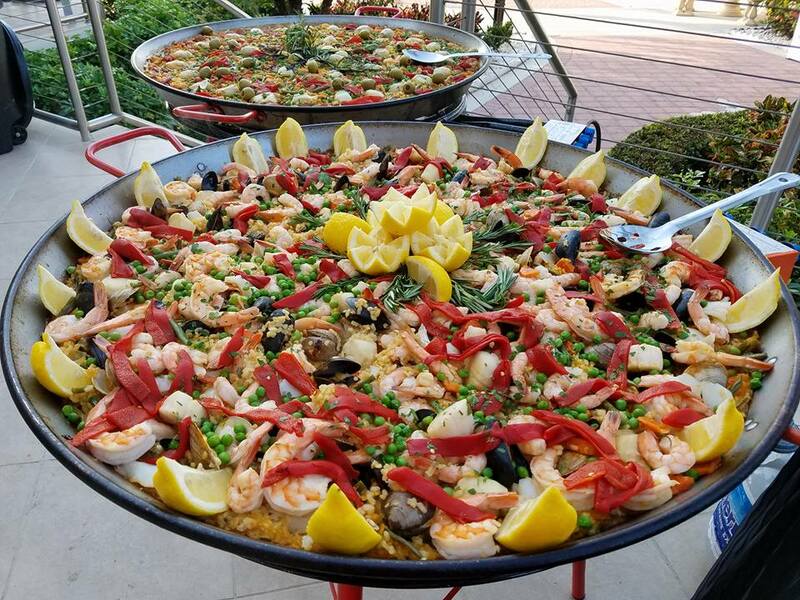 PAELLA MIXTA - the best of both worlds. It's a mixture of meat and seafood. 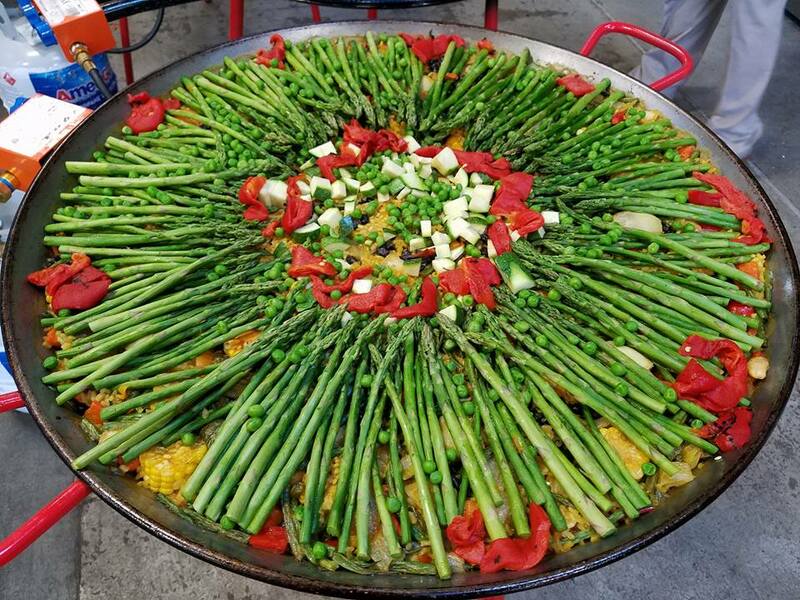 PAELLA VEGETAL or VEGETERIANA - Spanish cuisine has broken from its typical mentality by providing a vegetarian paella as well. 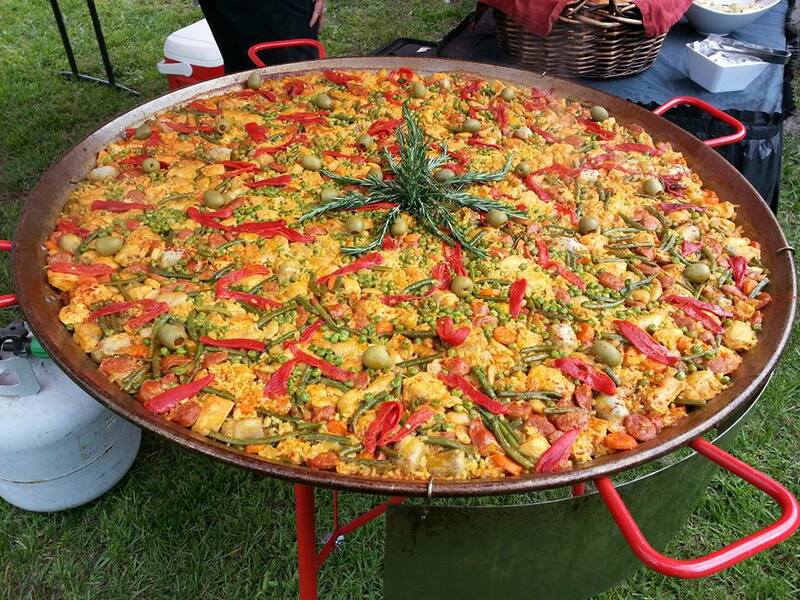 The cost will depend on the number of guest and the Paella you would like. 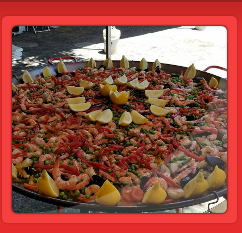 A travel charge will be added and determined based on distance (round trip) to venue location not to exceed 180 miles of Senor Pepe's Paella business location. No additional travel charge will apply, only if within local delivery area up to 40 miles. Saffron infused broth, calasparra rice, chicken, Spanish chorizo (pork), green beans, carrots, butter beans, tomato puree, diced onions, garlic. garnished with fire roasted piquillo peppers, artichokes, green peas and rosemary. Price includes: a tossed green salad (green leaf or romaine lettuce) cherry or grape tomatoes served with balsamic vinaigrette dressing, dinner rolls, butter and all standard disposable plates, napkins and eating utensils. Saffron infused broth, imported calasparra or Bomba rice, rabbit, chicken, snails, green beans, carrots, butter beans, artichokes, tomato puree, diced onions, garlic garnished with fire roasted piquillo peppers, green peas and rosemary. Price includes: a tossed green salad, (green leaf or romaine lettuce), cherry or grape tomatoes served with balsamic vinaigrette dressing, dinner rolls, butter and all standard disposable plates, napkins and eating utensils. 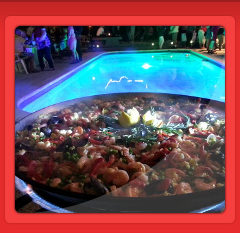 Paella de Marisco: (seafood) paella with shrimps, mussels, clams, sea scallops, fish (cod or Mahi) and squid. Pa ella de Marisco (seafood) with lobster tails. 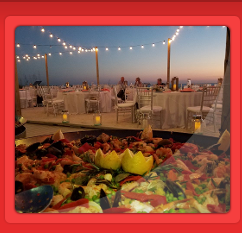 Saffron infused broth, bomba or calasparra rice, shrimps, fish (cod or mahi), sea scallops, mussels, clams, squid, green beans, carrots, onions, garlic, tomato puree and garnished with fire roasted piquillo peppers, green peas, rosemary and lemon wedges. *You can include a lobster tail per person (3-4oz.) contact us for pricing. Price includes: a tossed green salad (green leaf or romaine lettuce), cherry or grape tomatoes served with balsamic vinaigrette dressing, dinner rolls, butter and all standard disposable plates, napkins and eating utensils. 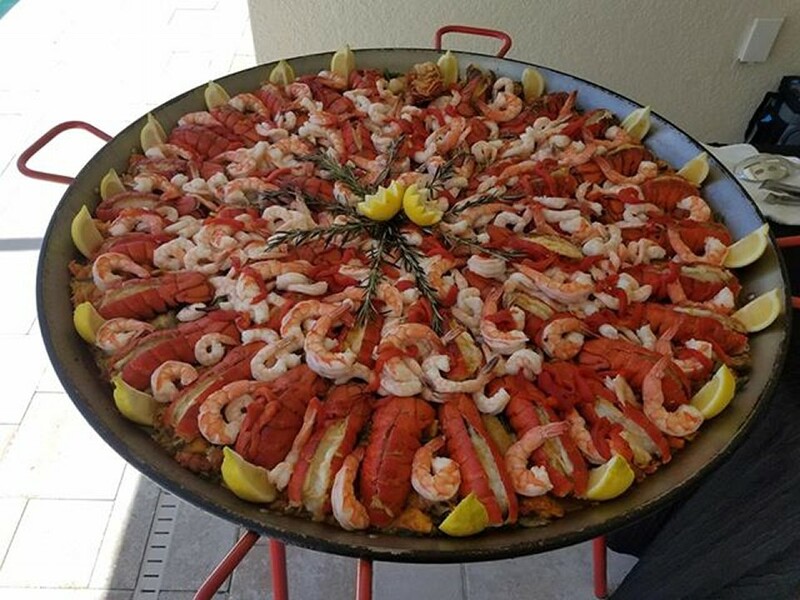 A mix of both the Valenciana paella (meat) and the Marisco paella (seafood). Your guests will truly enjoy this blend of both seafood, shrimps, sea scallops, fish (cod) squid, mussel, chicken, Spanish chorizo, green beans, carrots, tomato puree, diced onions, garnished with fire roasted red peppers, green peas, rosemary and lemon wedges. 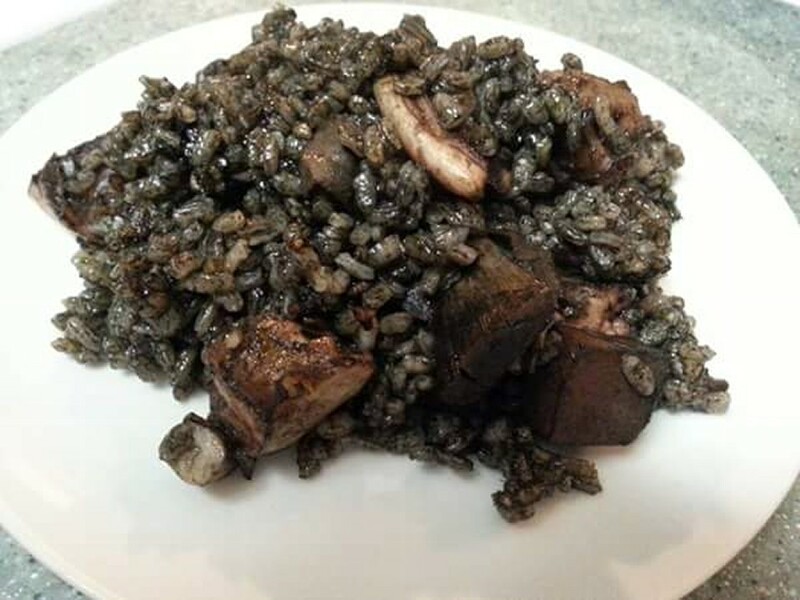 Imported calasparra or bomba rice cooked in squid ink & squid. 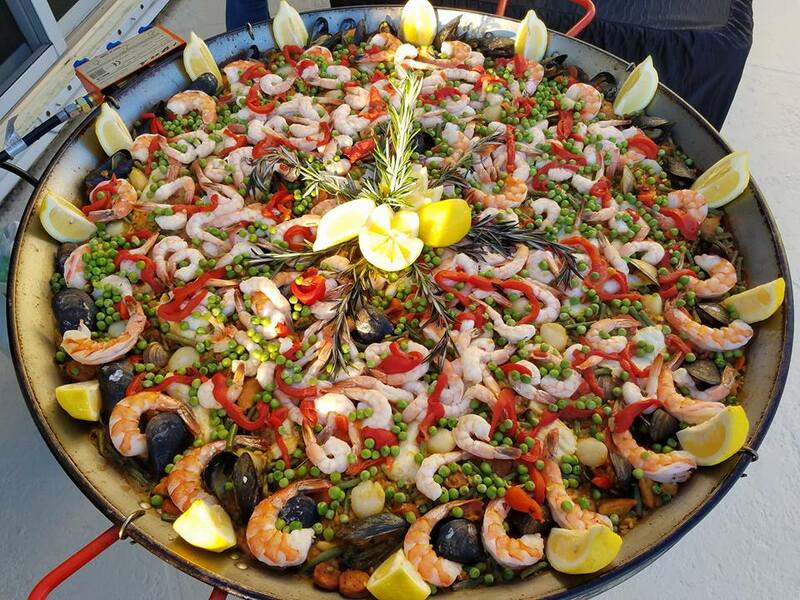 Imported calaspara or bomba rice, seafood broth, squid ink, shrimps, bay scallops, mussels, fish, squid, garnished with red roasted peppers, green peas, rosemary and lemon wedges. 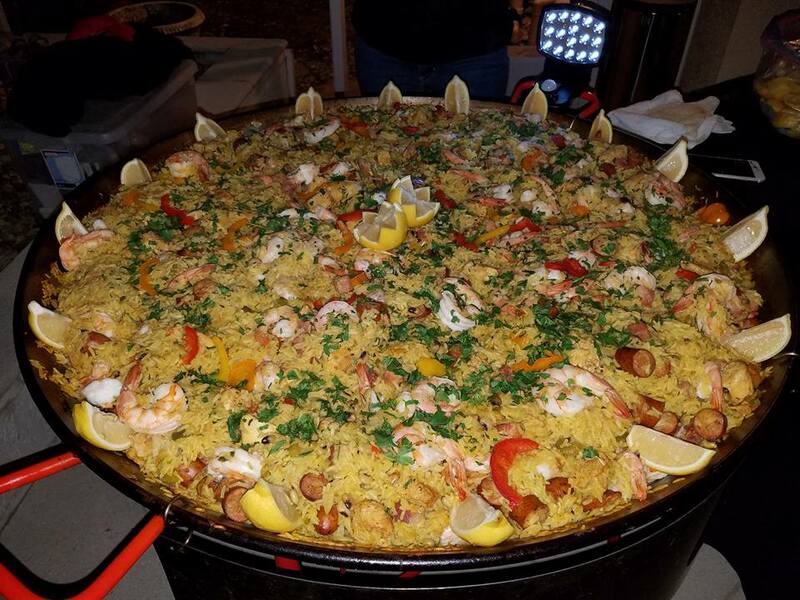 Señor pepe's takes paella-making to a whole new level! 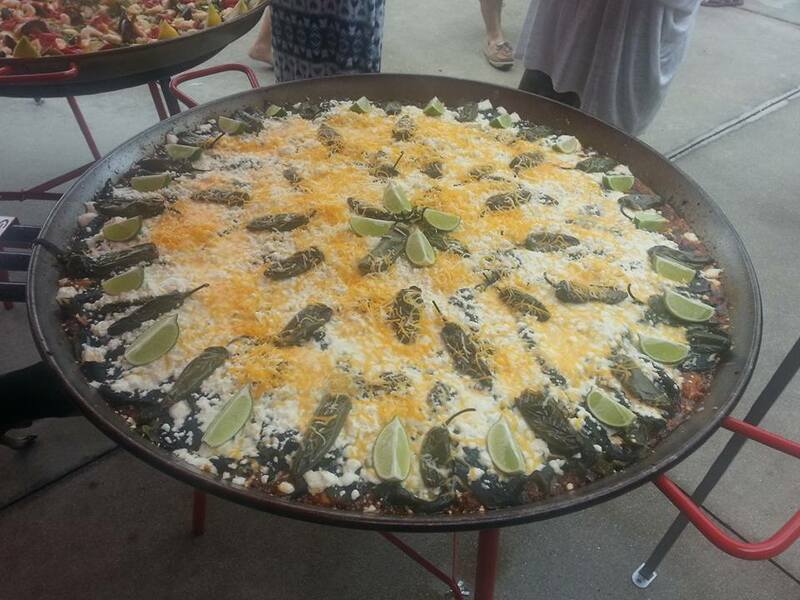 After vacationing in Mexico, I had to create a paella that would remind me of some of the great food I enjoyed there, such as Chile's relleno (stuffed poblano peppers): rice, refried beans, mexican chorizo and all their spices. 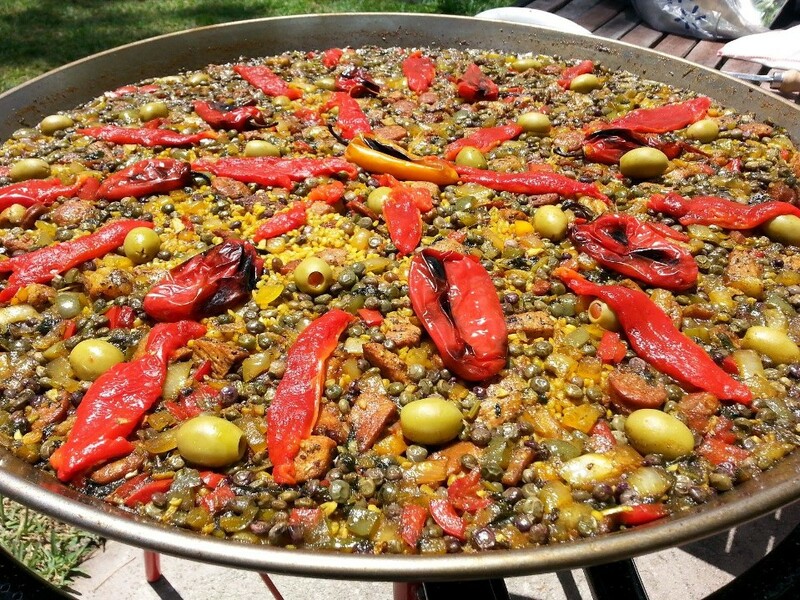 This left me no choice but to create La Paella Mexicana! Jasmin rice, chicken, ground beef, ground mexican chorizo, roasted poblano peppers, fried Jalapeno peppers, queso fresco (fresh crumbling cheese) fiesta blend cheese (monterey jack, chedder), refried beans, black beans, spices and garnished with lime wedges. Price includes: a tossed green salad (green leaf or romaine lettuce) grape or cherry tomatoes served with balsamic vinaigrette dressing, dinner rolls, butter and all standard disposable plates, napkins and eating utensils. long grain rice, Andouille sausage, diced Chicken breast, small shrimp, ham, black eye peas, tomato puree, celery, green peppers, onions, green onions, garlic, cayenne pepper, creole seasoning, rosemary, thyme, oregano, bay leaf, salt, hint of red chili pepper and chicken stock. 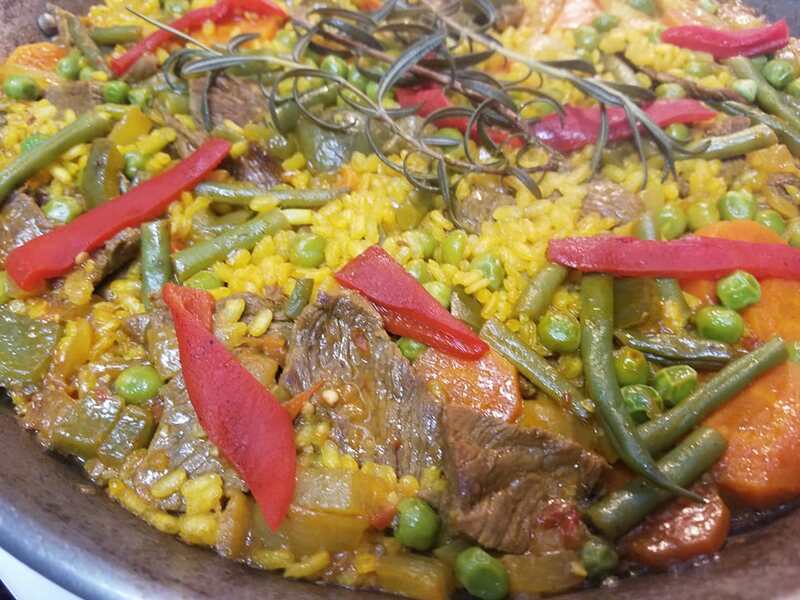 Prepared with imported calasparra rice, saffron infused beef broth, thinly sliced top sirloin steak, onions, bell peppers, garlic, tomato puree, extra virgin olive oil, green beans, carrots, butter beans, worcestershire sauce and garnished with green peas, piquillo peppers and rosemary. Price includes: tossed green salad (green leaf or romaine lettuce) cherry or grape tomatoes served with balsamic vinaigrette dressing, dinner rolls, butter and all standard disposable plates, napkins and eating utensils. Prepared with chicken (bone-in) cut in quarters, long grain rice, freshly made chicken stock, Saffron, onions, green bell pepper, chopped tomatoes, garlic and garnished with roasted red pepper slices. prepared with long grain rice, saffron infused chicken broth, boneless chicken, chicken thighs, chorizo, smoked ham, pork, sofrito (spanish seasoning) Tomato puree, carrots, green beans, olives and garnished with red roasted peppers. *Price includes: tossed green salad (green leaf or romaine lettuce) tomatoes served with balsamic vinaigrette dressing, fresh dinner rolls, butter chips and all standard disposable plates, napkins and eating utensils. Arroz con Gandules (rice with pigeon peas) "Puerto Rican style rice"
Prepared with long or short grain rice, safron infused freshly made chicken broth, smoked ham, pork loin, chorizo, onions, garlic, tomato puree, spanish sofrito (garlic, onions, peppers, cilantro) pigeon peas, sazon seasoning, salt, pepper, olives and garnished with roasted red bell peppers. Price includes: tossed green salad (green leaf or romaine lettuce) cherry or grape tomatoes served with balsamic vinaigrette dressing, fresh dinner rolls, butter and all standard disposable plates, napkins and eating utensils. Please remember to book your event early.